Carol Schneider is my mom and my inspiration. She was an English major and theater minor at Indiana University. She put herself through college and earned her teaching degree to become a high school English teacher. Then, she switched gears and joined the business world at General Electric, where she met my dad and then made me! She now lives in Boca Raton, Florida and works at the local Habitat for Humanity ReStore. One of my mom’s best qualities is her natural beauty. She’s 64 years old, but truly doesn’t look much older than 50. She’s always been extremely health conscious, but she’s been a passionate vegan since 2008 when we made the switch together. This woman glows, but not without a bit of effort. She’s been known to casually enjoy vegetables for breakfast, and sometimes she eats raw ginger to ward off inflammation. Her habits may seem a bit kooky to some, but it’s clear she knows what she’s doing. She radiates a kind of positivity that can only be found in genuine well-being. Suzannah Schneider: What was your favorite food as a child? Carol Schneider: Popcorn, cherry pie, mashed potatoes and noodles, chicken, bologna sandwiches. SS: If you were a food, what would you be? CS: Popcorn, coffee, basil, or garlic. SS: Is there anything you won’t eat? CS: Animal products, though I eat some weekly butter in small amounts, occasional goat cheese, and probably, unbeknownst to me if I fail to ask, some animal broth when eating out. SS: What was the last thing you ate? CS: A delicious, mouth sparkling orange! Soon I’ll eat a leftover slider from last night: slider seeded bun, grilled portobello, polenta, tomato, with tomato Veganaise. SS: One thing you wish someone had told you earlier in life? CS: LIVE life beautifully and ebulliently with compassion. I think I’m finally doing this now. SS: What was your dining hall go-to? CS: Oh, this is sad: 12 for $1 box of chicken pot pie from Kroger, congo bars, and apples (my only repentance!). SS: What’s the best dinner party or party party you’ve ever hosted? CS: Oh, so many, but here’s a great memory: I’m still told by friends how they loved our Valentine Eve Tapas and Chocolate Buffet. It was an open house from 8:00-11:00, so people could stop by before or after movie or other events. I felt it was creative. SS:Did you ever steal your roommates’ food from the fridge? SS: What is your drink order when you go to a bar? CS: White wine or dry Absolut martini 3 olives. CS: Hey, I’m Mom. I never got drunk. Seriously, I could count on fingers and toes in 45 years the number of times I was “drunk.” I’d call it inebriated. My mom and my dog, Ziggy, enjoying a summer night at home. 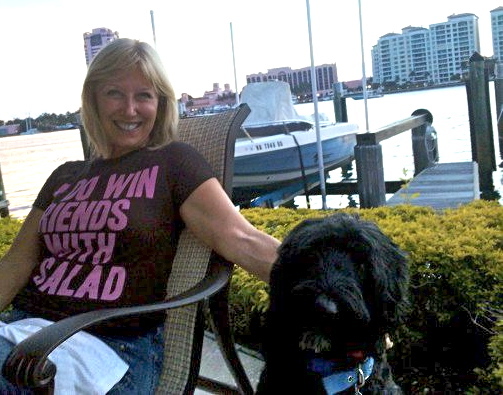 Her shirt says "I Do Win Friends with Salad." This woman is ridiculous! SS: Do you use recipes when you cook? CS: About half the time. I love to modify and create. CS: Food Made Fast: Weeknight from Williams-Sonoma. CS: Chocolate Chip Oatmeal Cookies. SS: What’s your biggest early cooking disaster? CS: Must have been a flopped cake in 4-H! Suzannah Schneider is studying Sustainability in Europe at the Danish Institute for Study Abroad. Her mom’s title of her memoir, if she were to ever write one, is “Dancing Cheek to Cheek: How My Bikini Thong Released My Creativity, and Other Tails of Cheekiness in an Uptight World.” Oh, Carol. Suzannah, I appreciate this interview and the work both you and your mom put into maintaining incredibly healthy lifestyles, but DAMN! 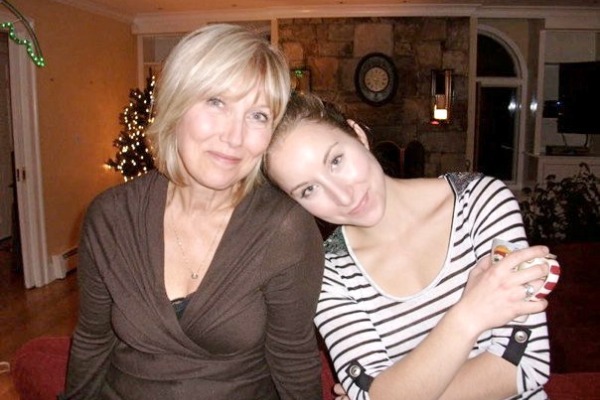 Look at those Schneider women cheekbones! Crazy high! Wow. I couldn’t help but comment haha. Suzie, luv, this is a TERRIFIC tribute to your dear Mom…..and it educated me about her likes/dislikes/preferences……who KNEW about those 12/$1 chicken pot pies! Eeeyckkkk…..but I do remember the bongo bars thang…..now, I wonder what’s actually IN a bongo bar? I love and miss you, sweetie, and can’t wait to see you sometime SOON, I hope.